I’ve got a thing for cauliflower. The possibilities are endless with this stuff, so I use it whenever I can get my hands on it. Though it’s good as a pizza crust, mashed like potatoes, baked like chicken wings, and stuffed into tacos – it’s also good on it’s own, roasted in the oven, covered in an array of spices. I could eat this cauliflower all by myself – the whole thing – and I wouldn’t feel guilty. Because it’s cauliflower! And it’s healthy! And it’s better than most other savory snacks I can think of! 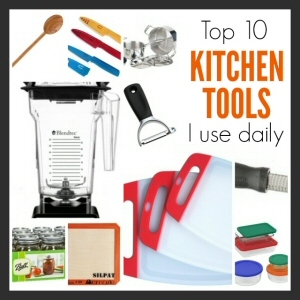 Oh, and did I mention that it’s crazy easy to make, too? 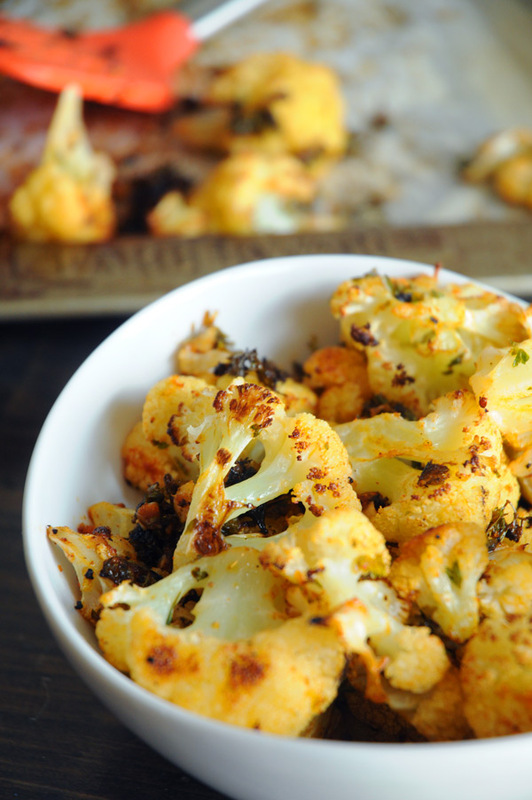 Chop cauliflower, toss with seasonings, bake, eat. The end. 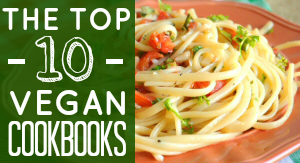 Serve it up on it’s own as a snack, or alongside pretty much any meal you could possibly be eating. Burgers? Yep. Pasta? Why not? Tacos? Of course! This cauliflower goes with everything. Eat it up! Preheat oven to 350F. Line a large baking sheet with parchment paper or a non-stick baking mat. In a large bowl, mix together the minced garlic, chili powder, cumin, olive oil, cilantro, salt & pepper. Once mixed thoroughly, add the cauliflower pieces and toss, making sure every piece gets coated nicely. 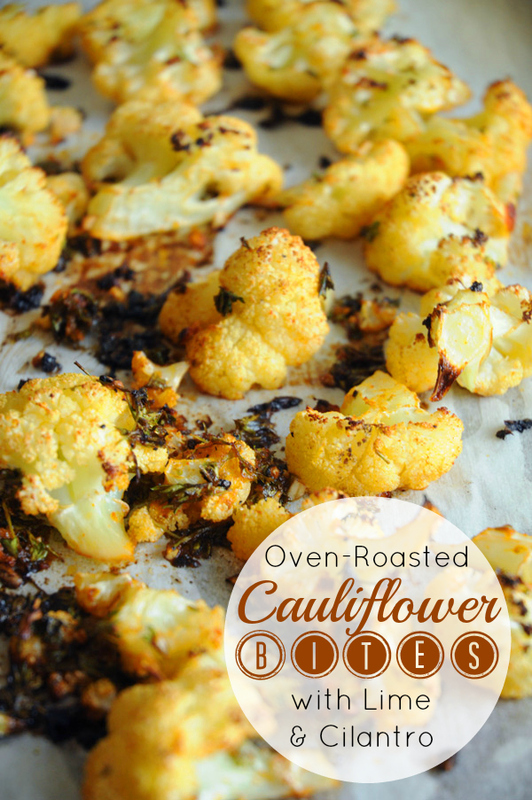 Bake for 30-45 minutes, or until the cauliflower is tender and has browned. 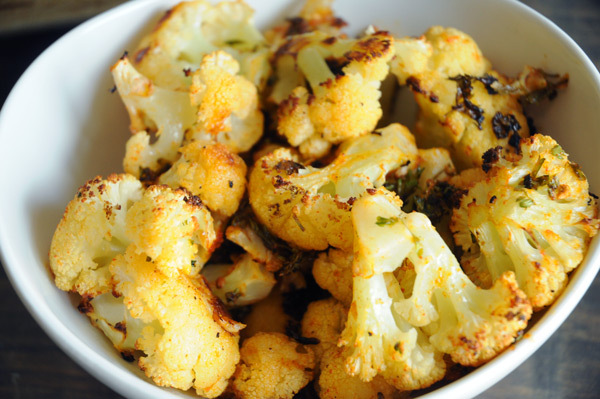 Add the lime juice and hot sauce to the roasted cauliflower and mix gently. Cover each piece with the lime juice and hot sauce. Remove to a serving dish, sprinkle with more fresh cilantro (optional), and serve immediately.